I love this salad. Mmm…it is so good. Even my non-salad eating husband loves it and there is the perfect amount of crunch to keep my kids eating it, as well. I love it so much I’m not even going to make any disclaimers about the use of ramen noodles for all the food purists out there. This salad is so simple and tasty that I make it often for a quick weeknight meal. And, if you don’t add the dressing to the salad all at once (just pour it over individual salads), this also makes great leftovers without the lettuce getting soggy. Enjoy! Preheat the oven to 350 degrees. Break up the ramen noodles with your hands and place them and the almonds on a rimmed baking sheet. Bake until the noodles and almonds turn light brown, 6 to 7 minutes. Meanwhile, pour the red wine vinaigrette into a measuring cup (or make your own with the recipe below) and stir in the packet of seasoning from the ramen noodle soup mix. Set the salad dressing aside. Place the slaw mix (I only use 1/2 bag), romaine lettuce, chicken, cilantro and scallions in a large serving bowl. Toss to combine the ingredients well. Just before serving, pour the salad dressing over the salad and toss to coat. Scatter the toasted almonds and noodles on top and serve. Can this be made the night before refrigerated and served the next day cold? Also does it makes much difference if the noodles and almonds are toasted? You could definitely try making it the day before but I wouldn’t add the nuts or noodles or dressing until right before serving. And yes, I do think it helps to toast the noodles and almonds – adds great flavor. This salad is wonderful with leftover sticky coconut chicken!! I made this last night for dinner and my whole family (including 3 kids 10&under) loved it! My favorite part was that they were eating broccoli and didn’t even know it. This is definitely a keeper. Just wondering in the sale mix, did you use 1/2 of a 16 oz bag or is 16 oz how much you used? Leslee – I used 1/2 of the 16-ounce bag – so 8 ounces total. This is a really old recipe I haven’t made in years so that’s my best guess. When you use 2packets of the ramen noodles do you also use both seasoning packets? Also, do you have any ideas on how to substitute the seasoning packet to avoid the msg in it? Hi Connie – to be honest, I haven’t made this recipe in years because I don’t use ramen noodles (or their packets) much anymore. I’ll have to try to come up with a recipe that has a from-scratch dressing to eliminate the use of the packets! This is THE BEST SALAD EVER!!!!!! I’m making this tonight. Is the chicken supposed to be warm? P.S. Didn’t use cilantro, but I added mandarin oranges, which went really well with the salad! Thanks for another great recipe…a new favorite in the family. Loved the dressing! Had this for dinner tonight & it was really good! I added sliced sugar snap peas & a bag of shredded purple cabbage that I had. The 2 bags of ramen noodles are a must IMHO 😉 Thanks for another great recipe! We love this meal. Our changes: We put the Ramen noodles in the skillet to brown them over med-low heat. We use broccoli and green cabbage in place of slaw (abt 2 heads broccoli and 1/2 head cabbage). We don’t add the seasoning packet to the homemade vinaigrette. And we don’t use cilantro. Thanks, Julianne! Glad you love this one and thanks for including your changes. They are always spot on. I made it and it was delicious. My kids ate a bit (they are not big salad fans) and my not-such-a-salad-fan husband liked it. I think it is because he is a big ramen noodles fan. 🙂 Thanks for the info on the slaw mix. I love this kind of salad! And it is exactly what I am needing to make to use up some already cooked chicken, tons of lettuce, and cabbage. What is in the coleslaw or broccoli slaw besides cabbage or broccoli and carrots? I am going to cut up my own slaw veggies and don’t want to leave out anything tasty. Thanks for the great recipe as always! AJ – the broccoli slaw I use for this has broccoli stems that are sliced thinly, along with carrots and thin slices of cabbage. Hope you like it! Idahomichele – glad you liked this! Thanks for letting me know. You have done it again! I tried the salad last night and my family loved it!!!! My husband and I were so delighted that we gobbled up the left overs for dinner tonight. YUMMY. I have now found my go to recipe for potluck dinners! hehehe, you used ramen noodles! That makes my day. 🙂 You, my friend, are far more creative than I! Mmm! That looks delicious. 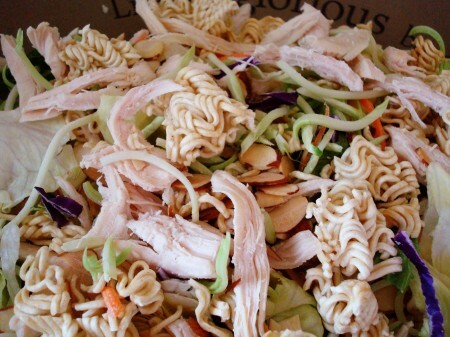 I want to make it but I’m scared how the husband will react when he sees ramen noodles sitting on top. haha. I might just have to wait until he goes out of town. 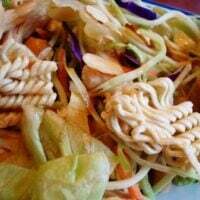 My mom used to make this salad all the time when I was growing up! It’s definitely one of my favorites! 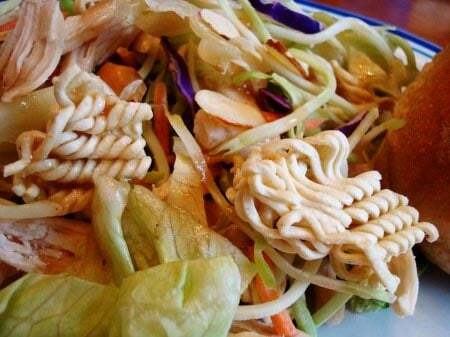 I always hear about this salad, but haven’t tried it. This looks really good though, so I may have to change that soon. I’ve had a recipe similar to this and loved it! I need to try it again.